Model making, woodworking, engraving, and similar craft hobbies are widespread today. Twenty years ago wood and fret saws were still common; today machine tools are increasingly moving into the hobby cellar. Due to advancements in technology and decreasing costs CNC milling machines, 3D printers, and lathes are no longer tools for specialists only. You will be able to use them in a short time without further technical training. You can build your own CNC milling using a kit or you can buy a product from shelf. Milling machines have many applications. They are very accurate and work within tolerances of 2-3 hundreths of a millimeter; provided you’re handling both the machine and the material correctly. Correct and safe handling is important. Machine tools are no toys and can be dangerous. Did you know that fine piles of composites or beechwood are carcinogenic or that some lubricants are highly allergenic and toxic? Technology and safety as well as maintenance are important subjects related to CNC milling and this book covers them all. After a detailed introduction to milling and milling machines and associated hazards, we explain how to find the right milling machine. Using the Stepcraft-2/600 CNC milling machine we explain the assembly for all other milling machines of the second Stepcraft series. The construction of a kit helps to better understand its operation and lowers the inhibition threshold to take it apart again for fixing and maintaining it. At the end of the chapter the milling machine is put into operation and produces a first workpiece. Following chapters cover milling tools and show how to select the right milling cutters for your application. You will deal with 2D milling and process materials such as wood, plastics, aluminum dibond, aluminum, or brass. Zouäll learn which milling tools determine the cutting speed and you’ll learn how to find the perfect settings. A T-slot table with machine vise and custom-built clamping jaws for clamping workpieces and accessories. A custom-built professional housing that protects against dust and dangers and reduces noise. A suction device with a centrifugal separator that reduces dust and chips to a minimum. A tool length sensor allows for easy measurement of the workpiece’s zero point. A custom-built water bath allows for dust-free processing of materials such as CFK (carbon fiber) and AFK (aramid/kevlar fiber). Eventually, the book explains 2.5D milling, underwater milling, and isolation milling of electronics boards. It explains all steps and operations of the various programs. 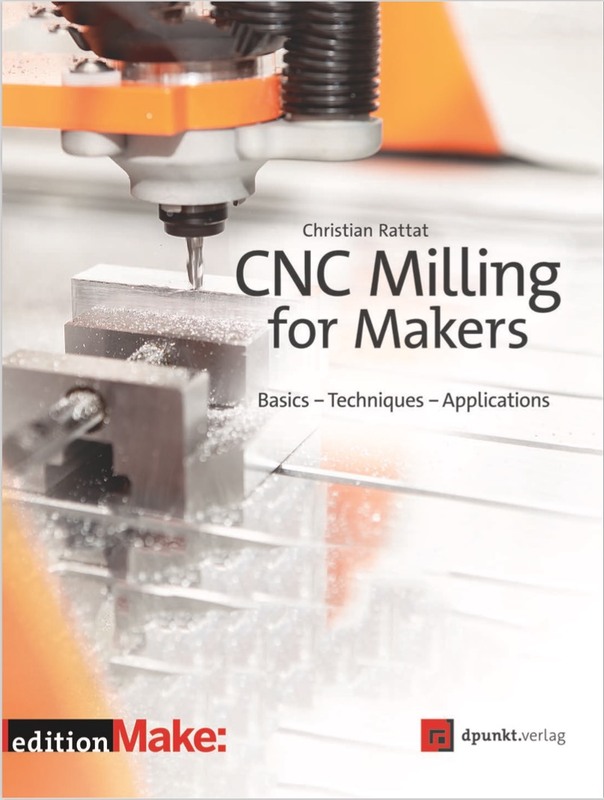 The book ends with a glossary that explains technical terms related to CNC milling.